It all started with the microwave. Anyone else curious about that sweet vinyl collection? So, after all those years of wanting to remodel the kitchen, why did Anne and Alan finally take the plunge? Simple: their built-in microwave above the stove stopped working. Here’s another shot of the old kitchen. On the right hand side, you can see the gap where Anne had to rip out the broken microwave. Once that came out, Anne officially had remodeling on the brain. “This is our first home,” Anne said. “We’ve lived here for ten years. We’d rather fix up this place than move, especially because we love the neighborhood.” And fix it up they most certainly did. From the built-in buffet, to the bar, to the larger window by the dining area, this Austin IKEA kitchen is virtually unrecognizable! The most impressive part? It only took just over a month. Wow! 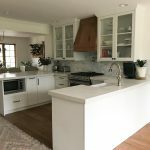 By working back and forth with IKD designer Chuck, Anne figured out exactly what she wanted — and needed — in her new IKEA kitchen. Luckily, an engineer did some quick thinking and made it work by using some of the window framing. Note the custom space for the new microwave. Anne wants to keep her countertops (which are also IKEA) as clear as possible. While the larger window in the dining area definitely brightened up the new kitchen, let’s not forget all the new lights. Anne wanted something stylistically similar to the light in the dining area, which is laser cut stainless steel. She scored her Eglo Carmelia pendant lights at VIP Outlet for about half the price of big box stores. Good find, Anne! If you’re reading our blog to get some inspiration, Anne has a piece of advice for you. Do your research and go with your gut on the contractor. …all in just over a month. IKEA could announce their kitchen sale any day now. Save yourself a lot of trouble (as well as a lot of money) and have your design ready to go before you hit the store! You can get started with IKD today.